The year of 2014 held many ups and downs for the world of public relations and brand relations for companies all over the world. As aspiring PR professionals there is plenty that all of us can learn from some of this year’s biggest public relations blunders. 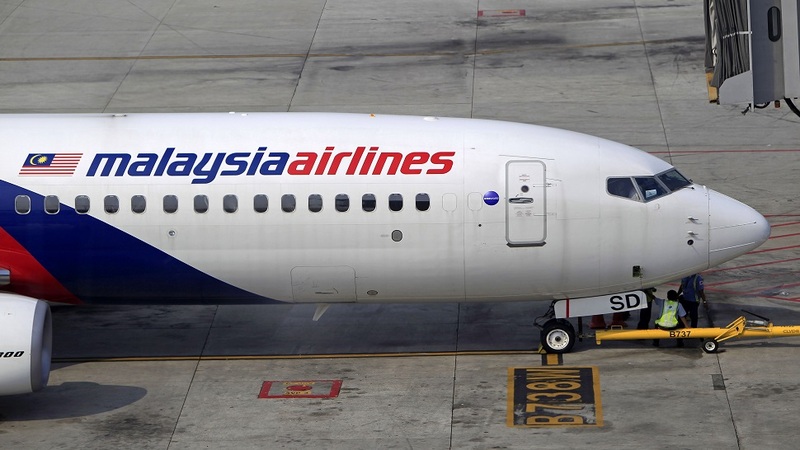 Malaysian Airlines: This airline has faced a year of tragedy and heartache a total of 537 lives were lost over the course of four months. On March 8 2014, Flight 370 took off from Kuala Lumpur, headed for Bejing. However, the flight never made it, seemingly disappearing into the Indian Ocean. Nearly nine months later the plane and passengers aboard have still not been found. The second tragedy came on July 17 when Flight 17, flying from Amsterdam to Kuala Lumpur was shot down over the Ukraine, killing 298 of its passengers. The company was clearly in need of some serious rebranding. However, their tactic in achieving a new image was executed in sloppy and tasteless means. Firstly, the company did not rename themselves, forever leaving a bad taste in the mouths of all future costumers. But, then the company took a step further. Intending to erase the past few months from people’s memories, they launched their “Bucket List Challenge” campaign via Twitter in Australia and New Zealand offering free iPads and plane tickets to those with the best answers. Consequentially, a bucket list is a list of activities and sites one would like to complete and see before they die. Though the campaign was quickly renamed and then taken down altogether, perhaps, the company might have first wanted to address the tragedies head on rather than forgetting and then proceeding with a tasteless Twitter campaign. Urban Outfitters: Typically this clothing brand verges on the edgy and controversial side, but with its mid-September release of the notorious Kent State sweatshirt the company seemed to have crossed the line. People were immediately outraged and took great offense to the sweatshirt, seemingly reminiscent of the tragic events on the University’s campus during May of 1970 when the National Guard shot and killed four students during protests over the Vietnam War. The sweatshirt was dyed red, resembling bloodstains. 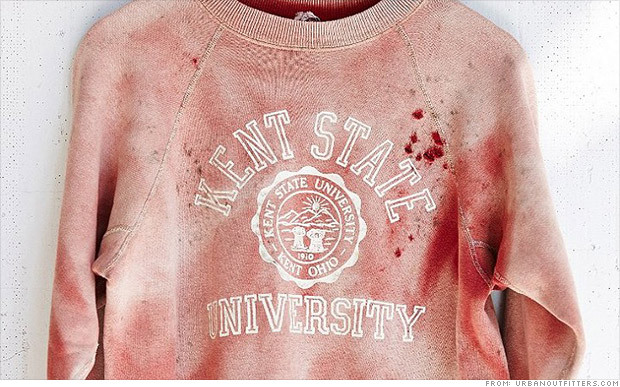 The clothing company immediately removed the sweatshirt from its site, saying that it had “sold out” and issued an apology saying,”It was never our intention to allude to the tragic events that took place at Kent State in 1970 and we are extremely saddened that this item was perceived as such.” Even in its apology statement, Urban Outfitters placed the blame of the scandal on misconception from the public, rather than owning up to the notion that perhaps the sweatshirt was just plane tasteless and disturbing. Though Urban Outfitters is known for being controversial and even removing offensive items of clothing in the past, the company may want to gain a better understanding of the phrase “too soon” and really own up to their mistakes. Brand Tweets During 9/11: September 11, 2001 is never a day that seems to get any easier as the years since the tragic terrorist attack pass by. However, Americans everywhere were quick to take offense this year when well-known brands took to Twitter in an attempt to profit off this day of heartache. During this year’s thirteenth anniversary, well-known brands like CVS and Burlington Coat Factory received some major heat when they tweeted pictures of the New York skyline with the iconic beams of light in place of the towers. However, instead of just letting the photo alone in a sign of remembrance and solidarity, the brands placed their logos in the images as well. Tweets were swiftly taken down as companies received heat from the public about the inappropriateness of trying to profit and promote during this particular day. 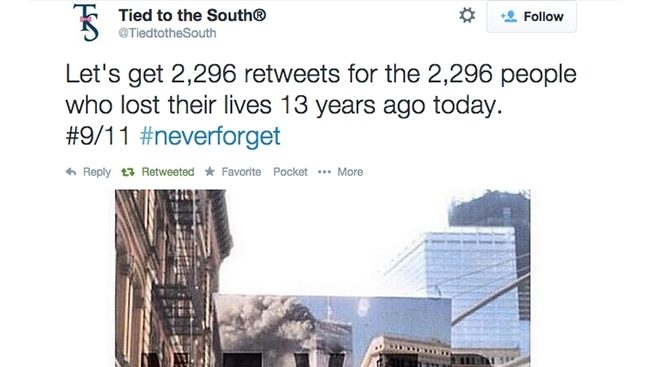 Another rather insensitive tweet came from a Birmingham, Alabama tie company asking followers to retweet their image of the Twin Towers as many times as there were people who died on that day. Again, this tweet was quickly deleted. When handling moments of crisis and remembrance brands are best to just not tweet at all or do it in a tasteful way, drawing no attention to themselves or their products. Though some companies missed the mark on their public relations campaigns during 2014 there is much to be learned from their mistakes. We can only hope that these brands and companies learn from their mistakes as well, otherwise 2015 will be another rocky road. 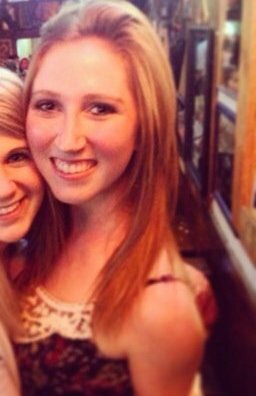 Danielle is junior majoring in strategic communication. She is specializing in english and retail merchandising & fashion product development. After she graduates, she wants to move to a big city, preferably New York, and work in fashion PR. Give her a follow on twitter at @DanielleMeyer17! Reblogged this on Danielle Dean.